I drove 20 minutes across Silicon Valley to quench a Xiao Long Bao craving at Shanghai Dumpling and was sternly turned away at 8:35 by a strong “we’re closed”. The restaurant was still full and running at full speed, which led me to wonder if my blatant whiteness got me rejected from the nearly entirely Asian-filled restaurant. Um, hello, Yelp says you’re supposed to be open until 9:30 on Sunday nights! Way to be racist, Shanghai Dumpling. I acted quick on my feet and went elsewhere to get my Asian food fix that night. As it turned out, this particular shopping center was a sort of Cupertino Chinatown with a number of Asian dining options to choose from. Directly next door to Shanghai Dumpling there was a similar looking restaurant called QQ Noodle. Sure, why not. 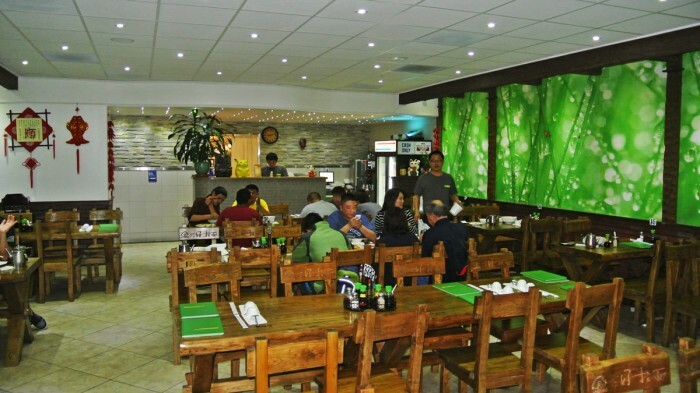 It was bright and clean looking and had pretty standard Asian restaurant decor. I figured I’d give it a shot and try to remedy my Asian dinner dilemma. After a quick once-over of the menu, I saw many hand-pulled noodle soups and other generic Chinese dishes but was immediately drawn to a few extra-special items that I didn’t expect to see and couldn’t resist ordering. I spotted many of the classics rarely seen on menus outside of my beloved New York favorite, Xi’an Famous Foods. So, I followed my gut and got myself an order of Liang Pi Noodles and a Stewed Pork Burger that they call a Rouburger, just like I’d frequently get in New York. First, the Liang Pi arrived. 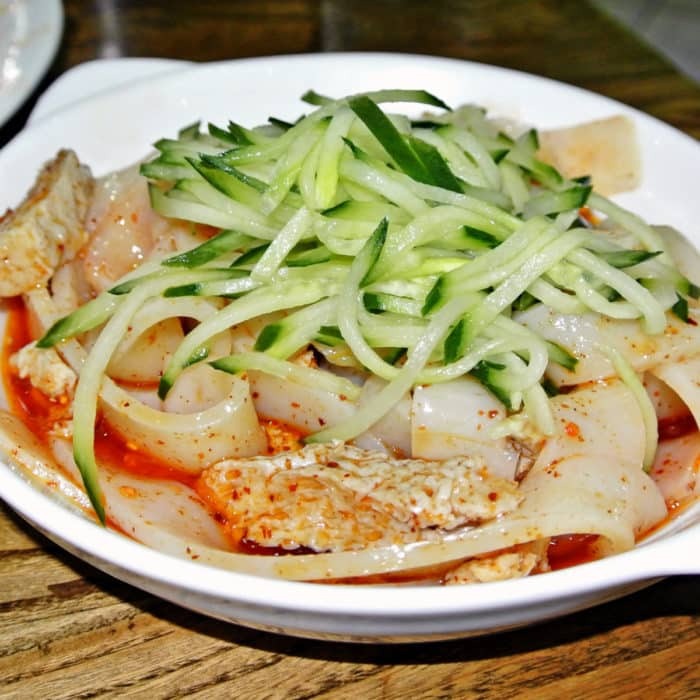 The thick, bright white rice noodles were topped simply with shredded cucumber and some hunks of porous wheat gluten. I know wheat gluten doesn’t sound very appetizing, but it’s meant to soak up as much saucy flavor as possible and usually does a good job at it. A glance at the glowing, multicolored, speckled oily sauce gave me a good feeling about the dish. The wriggly, chewy, slick noodles were served cold and were excellent, but I think the wheat gluten wasn’t as spongy as the version I’ve come to know and love at Xi’an. In my opinion, it didn’t sop up the spicy and sour sauce as well as it should have. Also, the sauce wasn’t as complexly spicy and sour as the one I’ve often enjoyed at Xi’an. What can I say, dining at Xi’an so frequently while living in NYC has given me high standards for this kind of food. Next, the pork burger came out and again, it looked just right. 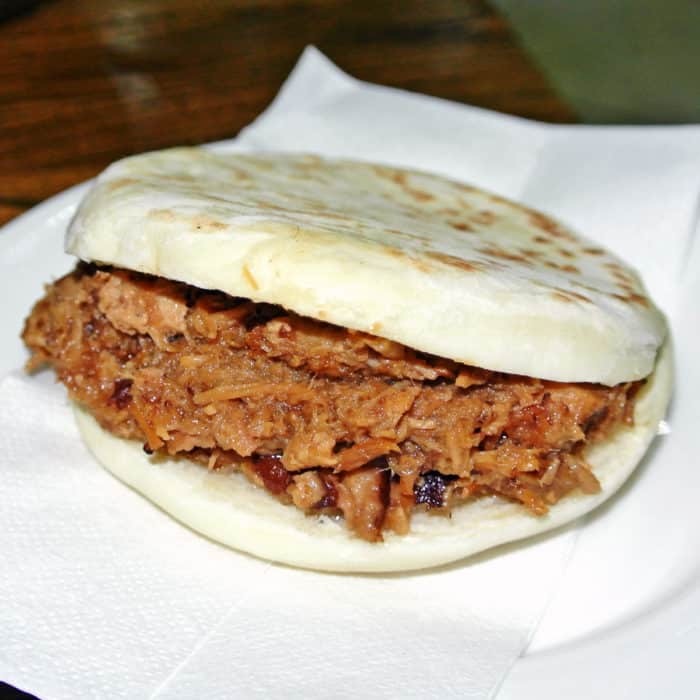 The English muffin-like bun was great and did its job to contain the super-tender, juicy, shredded pork meat. The porky sandwich had nice flavor, but ultimately it was milder than I would have liked and again just couldn’t compete with the rendition I know and love at Xi’an in NYC. In conclusion, though I was very excited to find these rare dishes in Silicon Valley and enjoyed my meal thoroughly, there was a certain complexity to each of these dishes that I found lacking. I realize that I’m probably spoiled by having Xi’an Famous Foods so readily available to me in NYC, but so be it. This meal barely scratched that itch so, Jason Wang, I’ll be seeing you at Xi’an soon. Oh and by the way, by the time I had concluded my meal at QQ Noodle, Shanghai Dumpling still had diners seated and eating, so screw you Shanghai Dumpling! 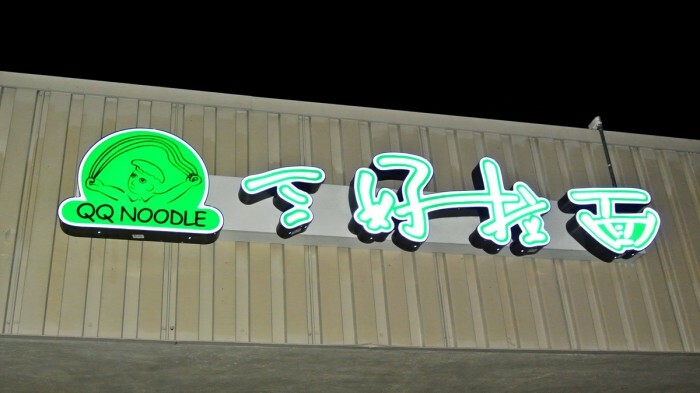 Know another place in Silicon Valley serving up Xi’an regions dishes? Let me know in the comments below.